Do you know a cloth diapering mama who would love to create some carefree timelessness for her family? How about giving her the gift of time? Take a load off of her shoulders & hand it to Mother Nature’s Diaper Service! 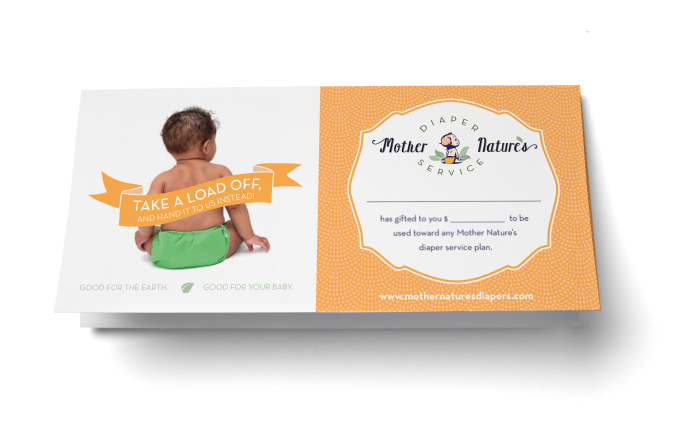 Give her some “chore-free” time with a Mother Nature’s Diaper Service gift certificate. Gift certificates can be purchased in any amount! Your gift can be redeemed and applied towards Diaper Service, Diaper Covers, Swim Diapers, Cloth Wipes, Wash Your Stash Deep Cleanings, and other products. To request a Gift Certificate, click here.